Transform Your Kitchen for About $500! As you know, I’m used to writing about the real estate market and other people’s homes. However, this blog post is going to be a little more personal than most, as we’ll actually be looking inside my own home, particularly inside my kitchen. My small, problematic kitchen. Or so I thought it was small and problematic. Ever since my wife and I moved in to our home, we’ve loved most of it. There were always things like, “Oh, I wish the wood floors were stained a different color.” “I wish the laundry room was a little bigger.” “I wish the guest bedrooms were just a tad bit larger.” But no wish was larger than the dreaded, “I wish our kitchen was bigger. 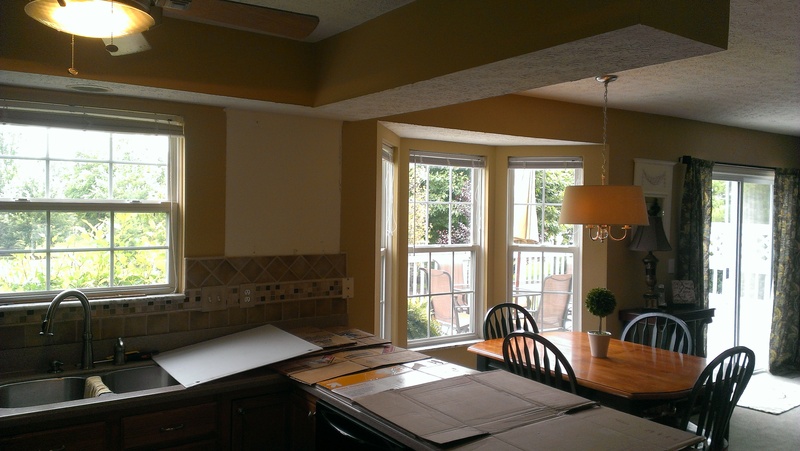 Actually, I wish our kitchen was bigger, had different colored cabinets, had more usable cabinet space, wasn’t so boxed in, wasn’t so dated, and didn’t have this eyesore of a row of cabinets above our peninsula cabinets/countertop!” Phew… I digress. Inside the Kitchen: The Good. And the Bad. First, now that I just mentioned some of the things we disliked about our kitchen, there were some bright spots. In fact, these bright spots were some of the selling points to our home. The Good. Even though the kitchen was small, all of the appliances were already updated to Stainless Steel (our house was built in 1996, so a lot of the houses around house had original appliances). Also, the previous owners had already updated the kitchen countertops (to corian) and the backsplash (to a stone-style tile with decorative glass tile pieces). We didn’t like the color of cabinets. The orangish oak was a thing of the 80’s and 90’s. There was this eyesore of a monstrosity hanging above our bar/peninsula. It hung down about 15 inches from the soffit, so it was the perfect location to block anyone from having a conversation with someone outside the kitchen (or else you had to duck down to talk to them). Plus, it pains me to say this, literally, I hit my head on it at least 3 or 4 times. Even though there were updates, it still just felt dated and old. Likely because it was original, styles have changed, and it was dark and closed in. Once the cabinet doors came in, I enlisted a friend to help me rip out the overhead section of cabinets. I installed a 36×30 upper cabinet on the side wall, and even though that was only 2 cabinet doors versus 4 smaller cabinet doors of the overhead piece, this actually gave us a lot more usable cabinet space. I hired an electrician to come in an install 2 recessed lights above our bar/peninsula before we put up that 36×30 cabinet. He needed to rip a hole in the wall for the wiring, which was fine, because it ended up being covered up by the back of the 36×30 cabinet anyways. I didn’t even have to cover the hole or patch it up. Somewhere in the early part of this timeframe, I removed all the old cabinet doors and their hardware/hinges/knobs. I also removed the drawer fronts. I did not order new drawer fronts from the online cabinet store. I figured they’re small enough, I’ll just re-use them after sannding, priming, and painting them. 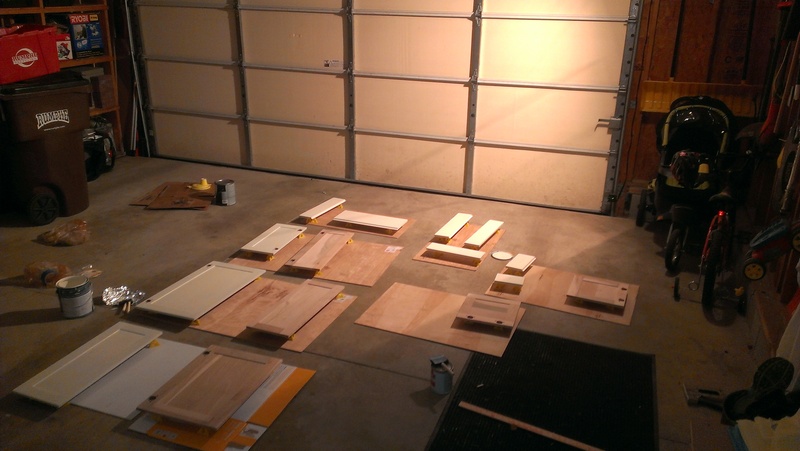 And that’s what I did… I bought Behr’s “Primer and Paint In One” and painted the unfinished doors with at least 4 coats. I used a foam brush to eliminate brush strokes (though in hindsight, I probably should have also used a foam roller). I also sanded the drawer fronts with a sanding block (like 8 of them actually) and then gave them 3 or 4 coats of paint + primer, all in one. FYI… you do not need to sand ALL of the old finish off the old cabinet faces. You just need to scuff it up enough so that the paint will adhere beautifully. Additionally, you need to sand and scuff up the cabinet frames and then paint those too. Sound like a lot of work? It is. It took me about 40 hours to do all of that. And remember, our kitchen wasn’t that big to begin with. 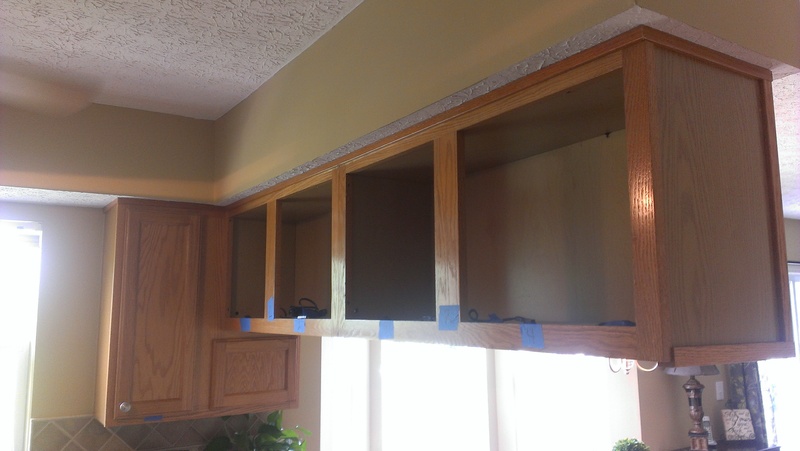 I also had to take off some of the base molding at the bottom of our cabinets. 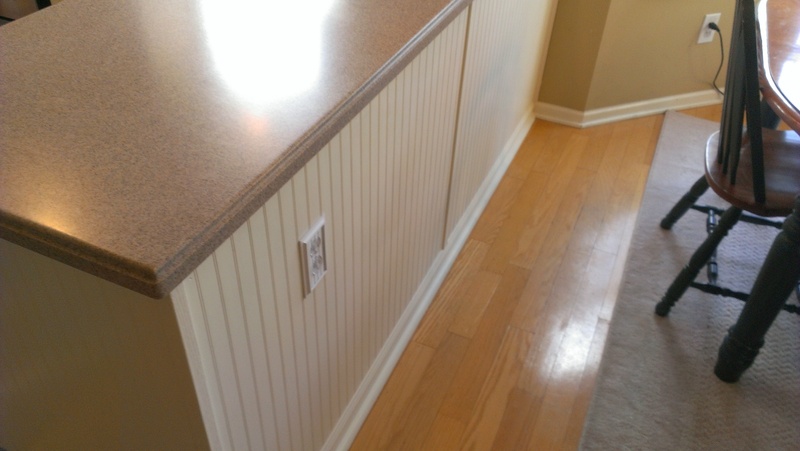 I wanted to put up sheets of beadboard/wainscoting on the backs of the cabinets and the sides of them (upper and lower). And I’m so glad I did. It turned out really well. But again, to do that, I had to take the base molding off and reapply new molding (the old molding broke when I removed it). Unless you want little cracks and crevices all over your kitchen, which would be horrible in a white or cream colored kitchen, you need to caulk everything. Every nook, cranny, crevice, everything… Every seem. Even if it seems like it’s tight-fitting and there’s no gap, over time, settling will occur, and you will notice the gaps between the baseboard and the beadboard, or the seams of the cabinet lines. I just used a tube of handheld white caulk. And I used a lot of it. Maybe 6 tubes? Maybe more? Once you get this far, you’ll be wondering why you ever started. It’s a lot of work. Its hard. But it starts to come together at this point, after the painting. 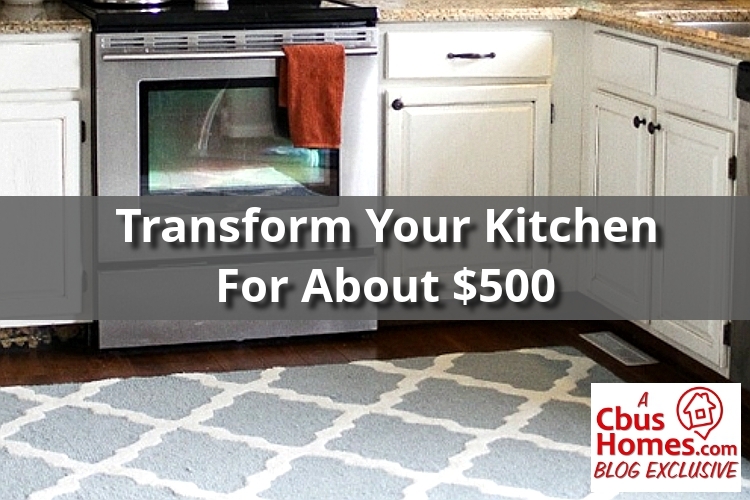 We finished off the kitchen with a new, fresh area rug in the kitchen. We also got a new light for on top of the fridge, as well as a couple decorative pieces for the counter tops. And voila! At the end of it all, I think I spent about $400 on the new cabinet doors. I spent a little less than $100 on paint. And I spent maybe $50 on beadboard panels and miscellaneous stuff. Not too shabby. And it completely changed the look and feel of the kitchen. It also changed the usability of the kitchen. Night and day. And well worth it.